Off to Columbus. Ohio, That Is. This will be my last post for a few days. Right around 8:30 tomorrow morning, Paul Herman will be picking me up and we’ll be on our way to Columbus and the second annual PulpFest. And I won’t be back until Sunday, once again with my satchels full of books and magazines and my checkbook empty. Heck, if I plan it very, very carefully, my checkbook will be empty several minutes after the doors to the dealers’ room open on Friday. It won’t be hard to do, especially with all the wares that’ll be out for display, fully designed to tickle everyone’s fancy. Well, mine, at least. Some of you I will see there, I am sure. If not, so long until next week Monday. For the rest of this evening, it’s time to pack. The one you see below is a fine example. It was taken of this blog earlier today by J. Kingston Pierce and is shown to great advantage over on his Rap Sheet blog. A Movie Review by Walter Albert: WHILE THE CITY SLEEPS (1928). WHILE THE CITY SLEEPS. MGM, 1928. Lon Chaney, Anita Page, Carroll Nye, Wheeler Oakman, Mae Busch, Polly Moran. Director: Jack Conway. Shown at Cinecon 27, Hollywood CA, September 1993. Even with a missing reel, this Lon Chaney film was a stunning thriller. Chaney plays a tough New York detective on the trail of “Mile Away” Skeeter (who’s always a mile away from the crime when it happens). Chaney’s rough-hewn face is a perfect mask for the hard-nosed cop, but bruised the way his heart will be. Nobody could ring the changes on pathos like Chaney, probably the greatest of silent screen dramatic actors. A smashing performance and superb photography and direction. 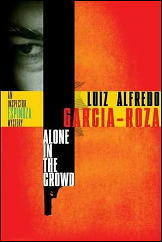 Archived Review: LUIZ ALFREDO GARCIA-ROZA – The Silence of the Rain. 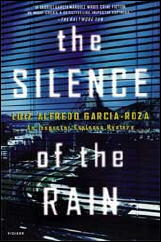 LUIZ ALFREDO GARCIA-ROZA – The Silence of the Rain. Picador, trade paperback reprint, July 2003. Hardcover edition: Henry Holt & Co., July 2002. This moody sort of detective novel was first published in Brazil and translated from the Portuguese, and to start matters off in the right direction right from the beginning, I highly recommend it to you. 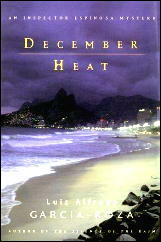 It begins in a mildly light-hearted fashion, as a mix-up over a wealthy executive’s suicide in a parking garage leads Inspector Espinosa of Rio de Janeiro’s First Precinct into handling the case as though it were a murder. I left thinking about the paradox: I trusted the information I could get from lowlife street gamblers but was wary of that same information in the hands of my fellow policemen. The worst was that I didn’t even know exactly how much I distrusted them, but one of the things I’d learned from a life on the force was not to confide in other officers. Espinosa called the precinct from the hospital No news. They kept reiterating that it was an isolated kidnapping, not related to the “normal kidnappings in the city.” Espinosa was stunned by the phrase: how could cops talk about “normal kidnappings”? Were there normal kidnappings and abnormal kidnappings? 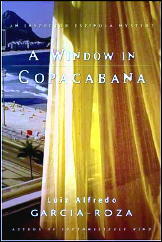 Espinosa is, the dead man’s widow decides, a rare bird, a cultivated policeman. He is attracted to her. She is so wealthy she does not seem to notice. Espinosa is a reader of Dickens and Thomas De Quincey, is afflicted by loneliness and self-doubts, and he is also better than decent as a reader of character. Complicating matters is the million-dollar life insurance policy the dead man had recently taken out, followed by the disappearance of his secretary Rose. Besides an almost other-worldly atmosphere and surroundings, there are enough twists and turns of the ensuing plot to keep any detective story buff more than satisfied, even with the aforementioned Colombo-like prologue. There is also an ending I know I’ve never read before — I couldn’t possibly have forgotten a scene like this, and if you read the book, as I’m strongly suggesting, you won’t either. And yes, the telling of tale does switch back and forth between first person and third. Just in case you were wondering! 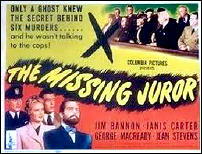 THE MISSING JUROR. Columbia Pictures, 1944. Jim Bannon, Janis Carter, George Macready, Jean Stevens, Joseph Crehan, with Trevor Bardette & Mike Mazurki (both uncredited). Director: Oscar Boetticher Jr.
Two stars carry over from the movie which I previously reviewed here, Janis Carter and George Macready (in The Fighting Guardsman), and Jim Bannon was in the one I reviewed before that (in The Great Jesse James Raid). It’s like old home week here on the blog. Jim Bannon plays Joe Keats in The Missing Juror, an ace reporter who saved a man from going to the gallows for a crime he didn’t commit. Too late, though, for the previously condemned man (played most convincingly by George Macready) had gone mad while on Death Row, and he perishes instead in a mental institution – by his own hand, his body burned beyond recognition. Bad karma all round, you might say, but then things start to get interesting. 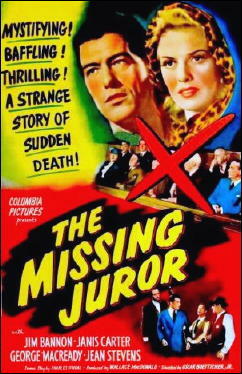 The members of the jury who convicted the innocent man have begun to disappear or to die in a series of unfortunate accidents. Janis Carter plays Alice Hill, one of the jurors who has survived so far, and in the process of warning her – she doesn’t believe a word of it at first, naturally – Keats finds himself falling in love with her. It’s a great premise for a real noirish tale. It’s only too bad that no one involved in the production of this movie knew how to produce a real noirish tale, nor even how to tell a tale that makes any more sense than this one does. There are enough holes in the story to sink a battleship, and no one in the cast ever stops to make the obvious questions – with the answers equally obvious – if there are any. Some questions simply don’t have any answers, or at least none that I can think of. It may be as obvious to you, if you’ve read this far. I’ve tried to careful in how I described the basic structure of the plot, but with deficiencies as great as those that this movie has, I’d have to say nothing to avoid saying anything. But do you know what? It doesn’t really matter that the story has more leaks in it than a sieve that’s been used for target practice. This is a fun movie to watch, from beginning to end. And some (if not most) of that is due to the director, more familiarly known as Budd Boetticher. Unusual camera angles, imaginative lighting and clever dolly shots keep things interesting, and the story doesn’t stop moving once, even if it doesn’t make a lick of sense. 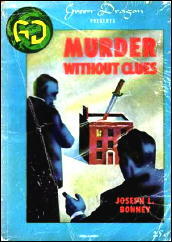 Reviewed by William F. Deeck: JOSEPH L. BONNEY – Murder Without Clues. JOSEPH L. BONNEY – Murder Without Clues. Carrick & Evans, hardcover, 1940. Digest-sized paperback: Green Dragon #16, 1940s, condensed. An amateur pugilist who plays the violin, dabbles in chemistry, smokes pipes when he’s pondering, deduces expertly, investigates crime, and has a roommate named Watson. 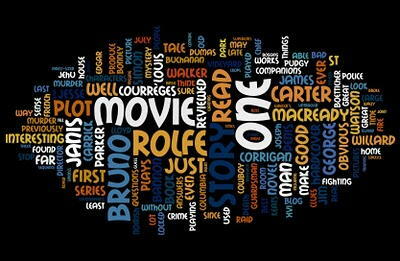 Yes, as you surmised, I am alluding to Simon Rolfe, who regards Sherlock Holmes as an “incompetent bungler.” There are differences, of course; Rolfe reads mostly, perhaps only, of the works of Montaigne. In this novel, either the first or the second of two featuring Rolfe — I’d deduce the first, since he meets Watson in this one — the police are baffled by a locked room stabbing at the home of a former vaudeville memory champion. Not only was the room locked, with untracked snow outside the windows, but all the inhabitants of the house have alibis, including the man the stabbed woman accuses of the murder just before she dies. The weapon, which could not have been removed from the house, cannot be found. An interesting detective, appearing in not a lost gem of the literature necessarily, but nonetheless a good read. 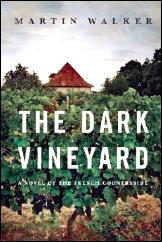 Reviewed by LJ Roberts: MARTIN WALKER – The Dark Vineyard. 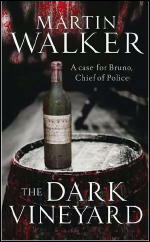 MARTIN WALKER – The Dark Vineyard. Quercus, UK, hardcover, 2009. Knopf, US, hardcover, July 2010. Genre: Traditional mystery/police procedural. 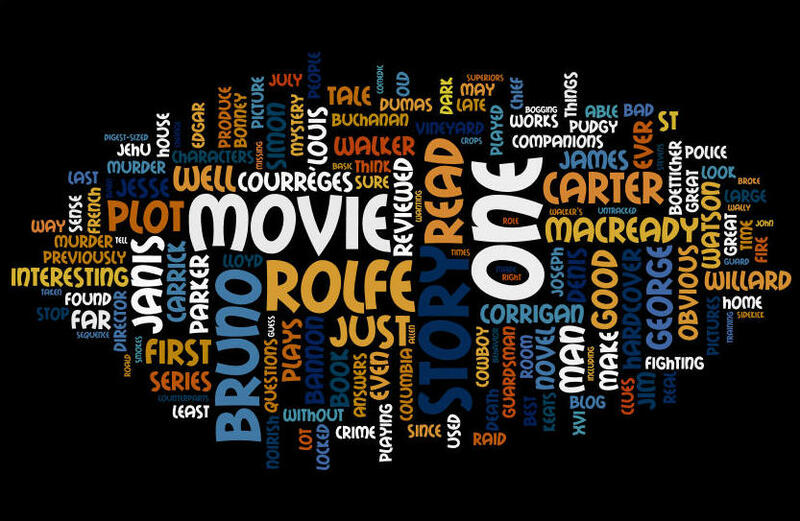 Leading character: Captain Bruno Courrèges; 2nd in series. Setting: St. Denis, France. 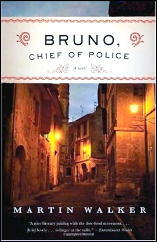 First Sentence: The distant howl of the siren atop the Marie broke the stillness of the French summer night. The alarm on the top of the Mairie (city hall) of St. Denis calls Police Chief Bruno Courrèges and the volunteer squad out to a fire of a field and large barn. Upon investigation, Bruno learns the fire was arson and the property being used to develop GMO (genetically modified organisms) crops; specifically, drought-resistant grape vines. The Californians are coming, wanting to buy a large part of the valley, which would bring jobs and produce varietal wines. Someone wants to stop it through vandalism and maybe murder. More and more, I look for good mysteries that rely on the mystery and on well-drawn characters rather than overt violence. This is just such a mystery. Walker brings the Pergord area, the fictional town of St. Denis, and the people to life with descriptions so evocative, you’re inclined to pack a bag. Walker’s inclusion of information on GMOs, the impact of climate change on the wine industry, the cost of land, and more enhances the story, without ever bogging it down. Bruno is one of the best protagonists I’ve read in awhile. He knows and cares the people and about whom Walker causes you to care as well. Bruno is savvy to what works with them, solution-oriented, his military training stands him well and he loves his community. What I most appreciate is his good working relationship with his counterparts and superiors. The plot is well constructed. Walker does use a number of French terms; most I understood through the plot and only a couple did I have to look up, but it added veracity to the story. This is not a fast-paced, guns-blazing, cars-racing story. It is one which builds upon itself through characters with a subtle tension as the story progresses. I did identify the villain, but not until three quarters of the way through the story, at which point I felt it was somewhat deliberate, but I didn’t guess the motive until it was revealed. Once I started this book, I found impossible to put down. This was a very good read and one I highly recommend. 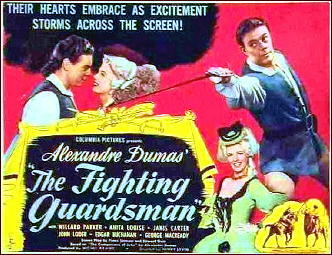 Movie Review: THE FIGHTING GUARDSMAN (1946). THE FIGHTING GUARDSMAN. Columbia Pictures, 1946. Willard Parker, Anita Louise, Janis Carter, John Loder, Edgar Buchanan, George Macready, Lloyd Corrigan. Based on the novel The Companions of Jehu by Alexandre Dumas père. Director: Henry Levin. But picture a young Edgar Buchanan in various late 18th century peasant garb, or posing as a guard of the royal court (Louis XVI in the movie, and Louis XIII in the book, if I have it right), and prone to funny sidekick behavior, you will see what I mean. 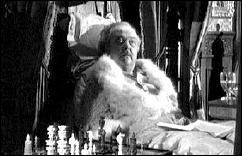 Also picture Louis XVI as played by pudgy Lloyd Corrigan (Wally Dipple four times on the old Ozzie & Harriet TV show), as he futilely tries to make some inroads, romance-wise, with Janis Carter, whom he has invited for a long stay at his country hideaway – a brassy showgirl type if ever there was one – which is not bad casting, since she’s playing the daughter of the local tavern-keeper, and as such is able to slip Roald (Willard Parker) and his Companions of Jehu some inside dope on what the king and his men are up to. Willard Parker, last mentioned on this blog for his title role in The Great Jesse James Raid [reviewed here ] is just as stalwart and upstanding as he was when he was playing Jesse James. At least he’s supposed to be a hero in The Fighting Guardsman, and I have to admit that he does it very well. And if the movie had been filmed in color, as it should have been, he would have done it even better, I am sure. A Review by David L. Vineyard: PETER CHEYNEY – It Couldn’t Matter Less. PETER CHEYNEY – It Couldn’t Matter Less. William Collins & Sons, UK, hardcover, 1941. Reprinted in the UK in paperback many times since. Mystery House, US, hardcover, 1943. 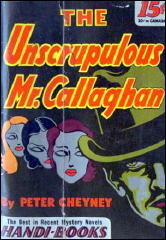 Also published as: The Unscrupulous Mr. Callaghan. Handi-Books #18, pb, 1943. Also published as: Set-Up for Murder. 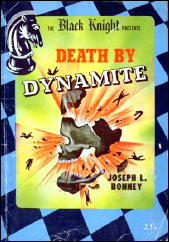 Pyramid #16, pb, 1950. Film: (France), 1954, as Plus de Whisky pour Callaghan! 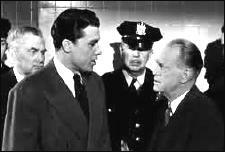 (with Tony Wright as Slim Callaghan; director: Willy Rozier). Callaghan — sole occupant of the downstairs bar at the Green Paroquet Club — tilted his chair back against the wall, put his hands in his pockets, gazed solemnly, with eyes that were a little glazed, at the chromium fittings of the bar-counter at the other end of the room. The bartender, wearily polishing glasses, wondered when he would go. His biographer, Michael Harrison, subtitled his book on Peter Cheyney, “The Prince of Hokum.” In many ways it isn’t far off. Cheyney was a reporter and public relations man who worked the West End club scene in London and had briefly been the secretary to Sir Oswald Mosley of the BUF (British Union of Fascists), though in fairness Cheyney got out well before Mosley and his Blackshirts turned to outright treason. Having dropped out of school at fourteen to become a writer in 1933 he turned to mystery fiction and in 1936 he wrote This Man is Dangerous about American G-Man Lemmy Caution, a British turn on the hard-boiled school and like nothing anyone else had tried. The language and the style of the Caution books is unique. Even Cheyney’s imitators never managed to ape it. Caution put Cheyney on the map. Along the way Cheyney also created Alonzo MacTavish a Saint like adventurer, and began his “Dark” series of spy novels that received high praise from the likes of Anthony Boucher and helped to inspire Ian Fleming and James Bond. Considering his career only lasted from 1936 to his death in 1951, he turned out 35 novels and 150 short stories. But most would agree his single greatest creation is Slim Callaghan, the British answer to the American hard boiled private eye who made his debut back in 1938 in Urgent Hangman. Slim belongs to the Sam Spade school of tough cynical and money obsessed eyes, less a knight in tarnished armor than a wolf in sheep’s clothing. It Couldn’t Matter Less is his fifth outing, and was the first I read, way back in 1970. It isn’t the best of the Callaghan novels but is still one of my favorites. The setting is wartime London. Inspector Gringall of the Yard, longtime friendly rival of Callaghan’s, has been clubbing and happens to call Slim to ask if he’s seen Doria Varette, a torch singer at Ferdie’s Place. “Perhaps he drowned himself in it,” he said. Slim has hardly agreed to take the case before a slick Cuban accented thug, Santos, confronts him outside Varette’s flat, but such things don’t faze Slim. Back at the office, Slim puts his loyal, and jealous, secretary Effie and his assistant, a long winded Canadian Windemere “Windy” Nichols, on the case and contacts Wilbery’s well-to-do Mother — might as well get paid twice for the same chore. That leads to Wilberys’ beautiful sister (beautiful women pass in and out of Slim’s life at a remarkable rate) Leonore. Meanwhile he meets a pair of Russian refugees running the publishing house that publishes Wilbery’s poetry (one of them of course the beautiful Sabine) who tell him Varette is the poet’s drug connection. At an illegal gambling joint he runs into Santos D’Inazzi, the Cuban who tried to warn him off Varette, who slugs him, and might have finished him off if Windy Nichols hadn’t stepped in. A hell of a woman thought Callaghan. A woman who could start a packet of trouble any time she felt like it — and finish it too. From this point on the action seldom slows. Callaghan romances Lenore, slugs it out in a West End nightclub with a pair of Santos partners, burgles the Russian publishers offices, and literally stumbles across Lionel Wilbery. The world was a hell of a place, thought Callaghan, a hell of a place. Wars and rumours of wars. Yet underneath the great battles raging over the surface of the earth, were smaller battles, the sort of guerilla warfare in which he, Callaghan, was engaged at that moment; the kind of guerilla warfare for which, he, the ‘private investigator’ — that title which covered a multitude of activities, cleverness, slickness — and Gringall, the police-officer, found themselves, for once, allies. Originality wasn’t Cheyney’s strength, but he did the hard-boiled patter, the tough guy stuff, and the atmosphere surrounding it as well as anyone working in the genre. Slim is in the mode of Sam Spade, Michael Shayne, Kurt Steel’s Hank Heyer, Cleve Adams Rex McBride, and Jonathan Latimer’s Bill Crane, narrated in the third person and a good deal tougher and less sentimental than the Chandler school. Care for it or not, the atmosphere of a Cheyney novel is distinct, smoky night clubs, good whiskey, and a hint of Narcisse Noir in the air. You can almost hear the torch singer and just make out the swarthy type in the dinner jacket waiting in the shadows with a knife meant for your gizzard. 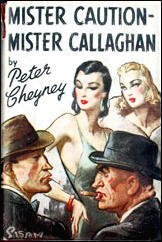 Callaghan, one hand in the cigarette box, saw, out of the corner of his eye, the shape of a knuckle-duster on Wulfie’s knuckles, showing against the soft cloth of his trousers. He lifted his knee and kicked Wulfie in the stomach. Wulfie uttered a horrible little shriek. He slithered down on to the carpet. Callaghan stooped, picked up the cigarette box, threw it as Salkey who was going for his hip pocket. The box hit Salkey in the shoulder, knocked him off balance for a moment. Just long enough for Callaghan to shoot out of the chair. He takes Salkey’s gun away from him and kicks Wulfie in the head. Then he takes the gun and a drink and calls Effie. Cool customer, Mr. Callaghan. Slim consumes heroic amounts of booze throughout his adventures. If you are impressed with the half a fifth of vodka James Bond consumes, or Philip Marlowe’s bottle of bourbon in his office desk, you will be in shock that Slim can even get out of his silk pajamas and into action, much less romance beautiful women and battle nasty thugs. He does laze around and stretch his long legs a good deal, but really, Slim has to be the Olympic champion of the genre when it comes to drinking. John J. Malone and his pals the Justus’s couldn’t hold a candle to him — they wouldn’t dare. It’s a wonder he doesn’t blow himself to kingdom come just lighting a cigarette. Slim was well played on screen by Michael Rennie in Uneasy Terms and on the West End stage by Terence De Marney and on screen by Derek De Marney in Meet Mr. Callaghan. Eddie Constantine, who was Cheyney’s Lemmy Caution on screen, had a few outings as Slim first. Probably his best incarnation however was the principle inspiration for Dennis Potter’s The Singing Detective. 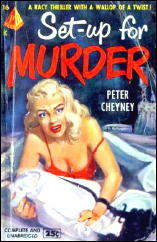 Neither Cheyney nor Slim ever found much of an American audience, but he was hugely popular in England, with sales of up to five million copies a year of his books, and also loved in Europe and especially France. 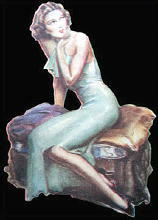 Cheyney’s novel Dark Duet, was the first book published in France after the Nazi occupation, the book smuggled in from occupied Holland, and on the streets while German soldiers were fleeing Paris. Jean-Luc Goddard later borrowed Lemmy for his New Wave science fiction film Alphaville. 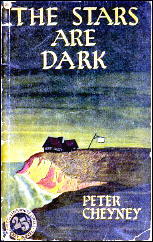 Anthony Boucher edited an anthology of Cheyney’s “Dark” novels, The Stars Are Dark, during the war, and Raymond Chandler praised his novel Dark Duet. Long, lean, and angular, Slim, with a cigarette hanging from his lip and a drink or a beauty never far from his lips, is Cheyney’s best creation. There may not be a lot of surprises in his oeuvre, but his books are fun and well worth reading, and no one ever did the atmosphere of the London club scene like Cheyney. Reading any of his books is the equivalent of a night of West End clubbing — just watch out for the hangover. Slim’s liver must be a wonder to behold. Note: Whatever Cheyney’s pre-war politics were, he made up a little for them with many of the 150 short stories, often featuring Slim or Lemmy, that were distributed to the troops in little chapbooks of a few short tales each. The output was huge and greatly appreciated by the troops. A 1001 MIDNIGHTS review: PETER CHEYNEY – The Stars Are Dark. PETER CHEYNEY – The Stars Are Dark. Dodd Mead, US, hardcover, 1943. Collins, UK, hardcover, 1943. 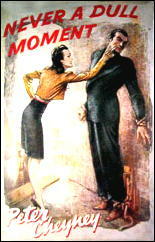 Reprinted in paperback several times, including as The London Spy Murders, Avon #49, 1944. Cheyney’s best work is his series of espionage novels generally referred to as the “Dark Series,” of which The Stars Are Dark is the second. Here, the breakneck pace of the Caution books is slowed by a genuine interest in character, which makes the story stronger. Quayle, the master of a British spy ring in World War II, is faced with the task of dealing with a man who has come from Morocco with what he says is important information about German troops there. Is this man what he seems? Quayle puts his agents into action, not hesitating to risk their lives to discover the answer, but it is Quayle who does the most work and takes the most risks. Cheyney does an excellent job of conveying the world of spying, with all its twists and double crosses. No one is what he seems, and everyone knows that; but no one is sure just what anyone else really is. Quayle tells his people no more than they need to know. Readers of John Le Carre and William Haggard would recognize Cheyney’s world at once. 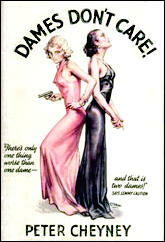 Not all Cheyney’s books with “Dark” in the title belong to his spy series, but another good one is Dark Duet (1942), first published in US paperback as The Counter Spy Murders (Avon, 1944). 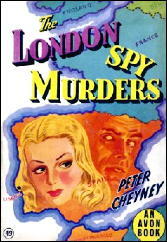 The Stars Are Dark was retitled The London Spy Murders (Avon, 1944).